The beauty of marble is unmatched by any other flooring surface. This material has been prized by architects and builders for centuries. Polished crema marfil marble tiles at wholesale prices don’t always mean low prices, however. For the very best deal on crema marfil tiles, consider buying from Stonexchange. Stonexchange is the premier flooring tile distributor in the Miami area. Our clients enjoy the lowest prices in the industry, reliable shipping and delivery, and unbeatable customer service. We are a direct importer and obtain our marble tiles from our own manufacturing and fabrication center. When dealing with us, customers work directly with the creator of these top-quality natural stone products. Crema marfil is one of the most popular of all marble shades. Its cream and beige coloration is the perfect neutral shade for floors, especially when the interior design includes dark wood furniture. Its polished finish is breathtaking, and the stone contains just enough patterning and streaking to give each floor surface a completely customized appearance. Marble floors require little or no maintenance. Although marble will crack if sharply impacted, the stone itself is not brittle and stands up well to repeated scuffing. So long as fluid spills are cleaned up promptly, the stone will not discolor. Marble is slightly absorbent, but the surface can be repolished and even given a water seal coating if needed. Marble helps keep building interiors cool in summer. The stone does not hold heat well, and the result is a cool air layer just above the floor surface. This is one of the reasons marble flooring is so popular in South Florida. A couple of ceiling fans may be all the air conditioning required to keep the indoor environment at a comfortable temperature. 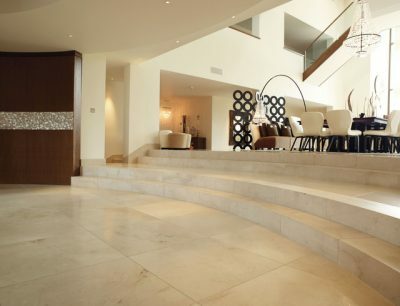 Crema marfil marble allows for an infinite number of design possibilities. The neutral shade of cream and beige marble tiles acts as a primary room color. Window sills and floor thresholds can be of the same material, and this shade is perfectly complemented by dark-stained wood furniture, white or off-white walls, and earth-tones for the drapes and bedding. Marble deposits are found throughout the world, but some of the most gorgeous tiles on the market were once part of large geologic formations in Europe or Asia. Huge blocks of marble are cut from the quarry, sent to a fabrication center, and thinned down into sheets that are about 5/8-inch in thickness. Specialized diamond dust-blade saws cut the sheets into 12-inch or 18-inch squares. Strips of thinned marble are also cut into tiny rectangles or squares, ready to be made into mosaic or inset pieces. Crema marble is a popular shade for flooring tiles as well as countertops, bathroom walls, and window sills. These tiles and sills are given a high polish finish, are packed into crates, and delivered by freight line to a shipping company’s port facility. The crates are then stacked into a larger container and put aboard ship. Once the tiles reach their destination, they are stored in a distribution center, ready for delivery to the client. The question for the client is a simple one. Which company offers the best pricing on imported crema marble? We at Stonexchange are proud to offer our commercial clients the best prices on top-quality polished crema marfil tiles. We own our own manufacturing facilities overseas and can therefore guarantee our customers the best possible per-piece price on these beautiful tile products. Our freight charges are kept to a minimum because we import full container loads. Our company maintains a large supply of this product in our Miami distribution center. Local dealers, retailers, home improvement centers, and construction contractors/installers can obtain this natural stone tile at rock-bottom prices, and their product is delivered directly to them via a regional trucking company or courier. What better way to procure the world’s finest crema marfil marble tiling than by ordering direct from Stonexchange? We are a favorite among local businesses and subcontractors because our supply of marble tiles is constant. We import on a regular basis, and can offer full-crate load pricing at any time of the year. Because we sell only to commercial clients, our minimum order requirement is never a problem. Dealers love to do business with a distributor that has ownership of the manufacturing center. There are no price markups because the product changes hands only once. This means that area retailers and flooring supply centers can pass the savings on to their own customers, increasing their rate of repeat business. A reliable source of crema marfil floor tiles or countertop material is a must when retaining a business account. Full-crate or full-pallet loads of crema marfil tiles contain pieces that are stacked on end. The tiles are very tightly packed to insure zero shifting of material during transit. The tiles are fully polished, ready for immediate installation. Customers can expect minimal breakage amount. Marble actually stands up quite well to the jarring effects of loading, unloading, and stacking of the crates. Most damage occurs as the result of an accident involving a lift truck. Crates are usually mounted on a pallet, making it easy for an experienced operator to transport them from the truck to the storage area. Orders containing other marble products such as window sills, thresholds, and countertop edges are given special attention by a quality control team. The rounded pieces, insets, and mosaics are properly cushioned to ensure little or no damage. Our company strives to keep any damage to a minimum, and we can accurately figure in this breakage amount into our initial price quotes. We deliver throughout the Miami-Dade County area. Our distribution center is strategically located in the Miami metro area, and we contract with local delivery firms to make certain that our commercial clients receive their product on time and on schedule. Unless the order contains special instructions for custom-cut marble tiles, the delivery usually takes only one or two business days. Last-minute ordering for a rush installation job is not a problem when doing business with Stonexchange. Remember that Stonexchange not only imports and sells the finest quality crema marble tiles, we also carry matching window sills, thresholds, and mosaics. Customers may wish to order matching materials if the design instructions call for the installation of these products. Subcontractors favor a dealer that always has these materials on hand, ready for immediate delivery to a retail outlet or job site. Custom sizes of marble tiles require a lead time of four to eight weeks. This is because the pieces must be cut and shaped at our overseas fabrication center. However, we will give an immediate price quote on these orders for non-standard size tiles, something that contractors love. A bid on an installation job is usually submitted even before the site work is finished, and it helps to know exactly what the materials cost will be as far in advance as possible. Retailers interested in obtaining full-crate loads of marble tile at wholesale prices are encouraged to consider doing business with a direct importer and distributor. The advantages include not only a per-piece cost savings but also reliability of delivery and an assurance that the product will always be on hand. This is especially important in South Florida, where construction and installation continues non-stop throughout the calendar year. As a leading importer and distributor of wholesale crema marfil marble tile, Stonexchange guarantees the lowest prices on beautiful natural stone. We look forward to hearing from dealers, retailers, and construction contractors. Contact us for pricing, delivery schedules, and information about custom-sized tiles. It doesn’t make good financial sense to purchase marble from middle-level resellers. Instead, go directly to the source for the finest quality crema marfil marble tiles. At Stonexchange, wholesale is truly wholesale.